This waistcoat has my favorite tailored fit out of anything I’ve ever taken in to be altered. The tailoring job is exquisite and despite being a masculine garment, is extremely figure flattering. It nips at the waist and flares at the hip beautifully. It’s such a fun, dandy-esque piece that I love pulling out for summer. 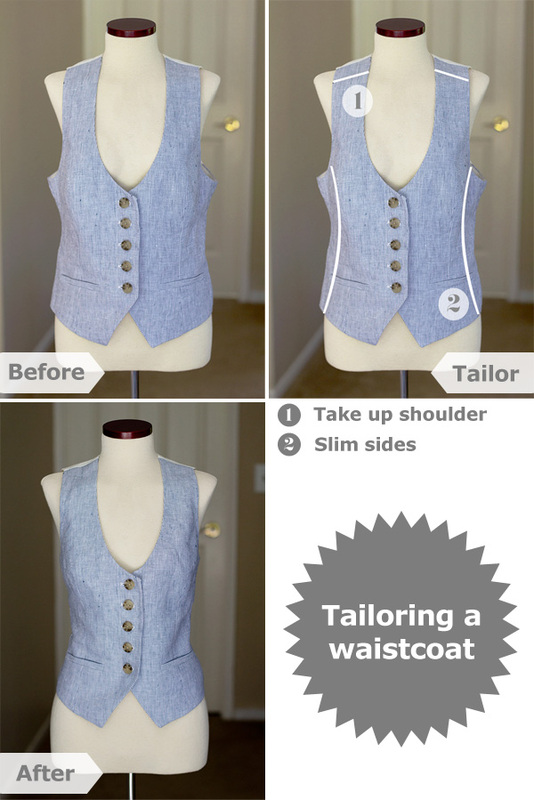 Last summer, I had this waistcoat altered down to my proportions by taking up the shoulder (moved the bust, hip and hem into the right spots, as well as made the arm holes smaller) and slimming the sides. Having a skilled tailor you trust with complicated alterations is essential for an overhaul such as this. The tailor I had work on this piece is very knowledgeable in menswear tailoring, and it came out flawlessly. This is very helpful, I have a pinstripe vest I really like, but it doesn’t sit quite right, so I never end up wearing it. Where did you get your Ever skirt? 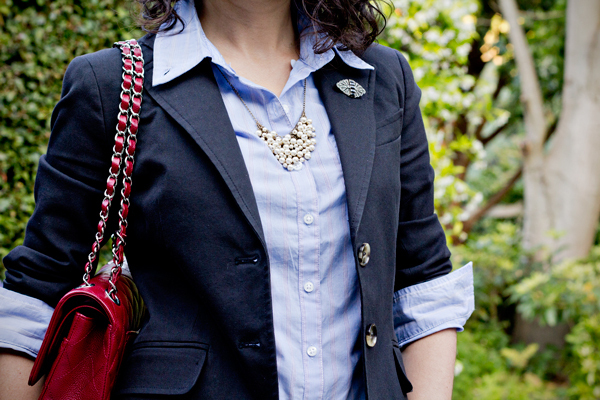 I love the flowiness (and pockets!). i remember when you had this done last year and i was really convinced i needed a vest! i actually thought about it again a week ago or so when i was looking at a theory one. still havent make the leap! i love it on you, though. so flattering. Aw! I remember seeing this up in Seattle…and probably telling you that the first time you posted it! It pairs so nicely with that skirt! Mr. AN took some beautiful photos here! Great look, head to toe. You look spectacular. You make me want to run out to find a good vest to add to closet. I LOVE that skirt! Too bad the company is not around anymore. It looks great on you! I love the outfit. 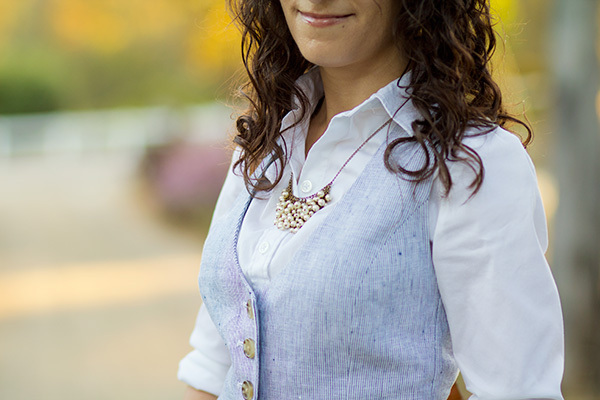 Just wondering — can you wear the vest with nothing underneath, for a different look? Or is it too — ummmm — revealing?? Kelly, this outfit looks fabulous on you! I love that you don’t try to “fake” the fit all the time, that you actually get your clothing tailored to fit you. I’ve discovered that if I fake the fit, I don’t reach for that item as often because it doesn’t fit. I really love the results on this vest! Waistcoats are so nice to wear, they give structure to an outfit. By the way: loved your little cameo on Wendy’s last video! Hi! I stumbled upon your blog just now, and I love it! I love your style, and as a petite woman (5’2″, 00) myself, having a place I can turn to for tips and inspiration is great! Oh, I have to thank you for that old post about altering the vest!! It helped me realize what was wrong with an Express vest I had bought and I was able to return it time.